Re: Battle Royale: SEMIFINALS now underway! Arcanine has forever earned my respect for repeatedly owning me with Close Combat. The only thing Charizard is good at doing is taking a Stealth Rock to the face before dying for me. but if this competition was expanded to all 693 Pokemon, who would be your top pick? ...where did you get the number 693 from? Yeah that's a mistake, good pick up! I always thought there were 693 Pokemon in total for some reason don't know where I got that from though. Anyway.. here is your progress scoreboard! And of course it's time for our second wave of moves! Arcanine used Howl! Arcanine's attack rose 1 stage to +1! Charizard used Earthquake! Arcanine's Air Balloon activated! The attack gave Arcanine a +1 boost! Arcanine used Thunder Fang! Charizard's hit by -2..
Charizard used Bulldoze! Arcanine's hit by -2.. Arcanine's speed fell 1 stage to +1! Arcanine's attack is now 165, against Charizard's 126 (Arcanine +1, Charizard -1). And of course, two special attacks have just rocketed the arena! Let's take a look at the damage that's been dealt..
And just when you thought Arcanine had it in the bag with his strong movesets... the random number generator was far too kind to Charizard, giving him a +1 advantage going into the final 48 hours! What's going to happen next? With votes due to come in, will anonymous voting turn the tide again and see Arcanine surge out in front? Or will it be the long favourite Charizard who will spread his wings out wide in the finals? It's too tense! I'll see you in 48 hour to reveal any anonymous votes I may have received! Everyone gets three anonymous votes from now onto the finals. This means that you can use 1, 2 or 3 of your votes in this match, the next match or the final. Eg: if you decide to give someone +3 during this round, you will not be able to participate in anonymous voting for the next matches. If you decide to give someone +2, you still have +1 left to use either in the next semifinal match or during the final, and so on. Like always, these will be anonymous, however I will have my own counter to gauge how many you have left. You can vote anonymously by PMing myself. And also just to clarify, sponsors can not anonymously vote for themselves (which was going to be the case if we were going to continue this with Psybucks). You do not have to use up all your votes either. If you haven't yet voted in this round, you may still do so! The second finalist will be determined 48 hours from this post. Good luck to supporters of both parties! Arcanine. Tough choice because of my fluctuating opinions of Charizard. Arcanine comes out on top today. I wanted to like Arcanine (really, I did) but Charizard was my starter and the fire type on my team plus it didn't help that I forgot Arcanine in the daycare. Maybe if I had chosen a different starter I would have used Arcanine and hence like it more but... c'est la vie. And I kinda figured SL wasnt from the US judging by his post times. D8 ASDFHJKLG THE LURKERS KNOW EVERYTHING. EVERY. SINGLE. THING. Woah-ho-ho! What could that mean? Unfortunately I can't count your votes (Dragonair101 and Super_Typhlosion), because they missed the 48 hour cutoff but we'll see now if it would have made a difference! So Charizard progresses... OR DOES HE? CONGRATULATIONS TO HAUNTER AND ARCANINE who will be facing off in the finals! Wow what about that hey! One of the more up and down matches we've seen for quite a while in the arena! Will the grand final hold as much tension and drama as this own semifinal has? Only one way to tell! Keep on holding tight for your coverage as the very first Battle Royale almost draws to a close! At the moment, I'll be explaining to the sponsors how the final round will work. It will be a culmination of all the factors we've been playing with in the past. Once the sponsors have made their decisions, I'll make public how the format will work, and then the day after the final stage will start. Voting will last 7 days, after which the champion will be announced. Get ready for it! In the meantime.. are you happy with your two finalists? What do you think some of the strategies employed will be? Who's stats/movepools are you favouring at the moment? And more importantly who will come out on top to win the championships?! > Six moves will be chosen, instead of four. There will be 3 waves of attacks. The two attack limit will still apply. - Normal votes, poll results and anonymous votes will all be added together, and the champion will be revealed! Sponsors: make sure you get your information finalised soon! I'll be starting the matches within 48 hours. Voting and poll openings? That means that a person could theoretically vote twice for the same thing. Am I following you correctly? So throughout all seven days you get one vote? Or is it on each day? It seems after not posting for 12 pages, stuff has happened. But a member of the Gastly line survived? Woohoo! Looks like I know what my vote will be. Wait, what? I actually have no clue what I'm supposed to do any more. .-. Day 1: Vote for Haunter in this thread. Day 3: Vote for Haunter in the poll in this thread. Day 5: PM DragonPhoenix your 3 anonymous votes for haunter. Do I feel ashamed for this blatant propaganda? No. Last edited by DragoBoy on Sat Aug 11, 2012 8:56 am, edited 1 time in total. Yes, and theoretically up to 5 votes can be counted, assuming that you want to use up all 3 of your anonymous votes + poll vote + standard voting. You only get one standard vote, but the round will be open for 7 days, instead of 3-4 as in the previous rounds. Actually DB got the process pretty accurately in his post, the justification for the different methods of voting is that because I know a lot of people can't check out the forums everyday, so it's just a chance to "reward" the ones who have been following the thread constantly, thereby giving them more "power" in the final round. I know I've been pretty absent lately and it's probably caused a lack of interest in this thread but I will make it a priority within my personal life to actually see this to the end. Once again thanks for your patience and hopefully I'll be able to get this show back on the road. Wait, for the three anonymous votes, do they have to be in three separate PMs, or can one PM just say 'here are my 3 votes for Haunter'? Anonymous votes are sent all in a single PM. Arcanine used Protect! Arcanine is protected! Haunter used Swagger! But it failed..
Arcanine used Snarl! Haunter's Colbur Berry activated! Haunter took no damage! Arcanine's Dark Gem activated! Haunter took -1 damage.. Haunter's Special Attack fell 1 stage! Haunter used Dark Pulse! Arcanine's hit with -1.. Arcanine's attack was boosted +1! And to kick things off... an initial physical attack dealt at random! Move 1: "The arena is hit with a Tail Slap attack!" Are Arcanine's stats far too strong for the extra flexible ghost to play catch up? Haunter's ghost type comes in handy here, giving him an immunity to one of the most populous move typings available - and with two special moves yet to rock the arena, Arcanine may find himself in a bit of a whirlpool if he can't break out for a strong lead. What will happen? Only time will tell! For now, voting is open! Who will finally come out on top after months of battles, to become the CHAMPION of the BATTLE ROYALE? I still remember that I could of had Haunter, so I'm boycotting the voting for him. I've said it before and I'll say it again, Arcanine is one of my favourite Fire Types. In the same evolution line as my favorite Pokemon, so probably one of my favorite over all (within my to 10 or 15). One step down from the Master of Badassery himself, I can't help but pledge my support to him. 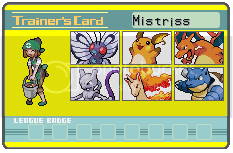 Initial advantage or not, I will be pushing for Haunter's victory all the way. Aaaand...it began. I'm of course going to vote for Arcanine , for reasons I've repeated many times before.